In today’s funny dog video, we meet a dog who vocalizes his wish to go for a walk. How can you not love dogs? Watching this videos brings such a smile to my face – I hope you enjoy them as much as I do. Best Friends Perform Canine Freestyle! In today’s fun dog videos, watch as Kate and her dog Gin perform some “canine freestyle”on Britain’s Got Talent. What a gorgeous and talented pooch..
Can a non human win Britain’s Got Talent? What do you think? That Leg’s Trying To Steal My Bone! Today’s funny dog video is hilarious! Watch this dog chewing away at his bone and trying to fend off that approaching leg coming in for the steal.. These Dogs Just LoveTheir Momma! These videos bring such delight – this one is of dogs talking and there seems a consistent theme that these dogs love their momma! 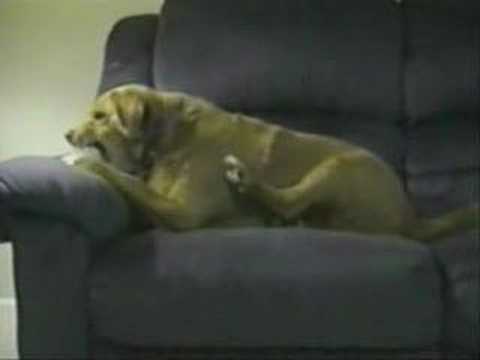 This dog video stars a very well behaved pooch – see for yourself..
Boredom and variety are always inter connected in case of dog misbehaving. Yes. This is true. Many a times, boredom can be managed with variety of materials that will distract the animals to a greater extent. Hence, the dog may not do the abnormal or unwanted activity arising out of the boredom experienced by it. Boredom experienced dogs may have different types of behavioral patterns. For example, some dogs will be seen barking continuously and some may be engaged always in some digging activities. There are many ways to get your dog out of its boredom activities. Many toys are available which simulated duck, dog, rodent etc. These may be kept inside the crate and in particular, puppies love these items. A buster cube with multiple treats may be placed in the dog’s shelter and the animal soon understands on how to roll the buster cube to get the treats it prefers. A Buster Cube is an ingenious toy use for simulating and activating your dog during play and feed time. Instead of placing the food monotonously in one place, change the place of feeding suddenly. Such actions will be helpful for removing the boredom like activity in your dog. Activities pertaining to boredom need to be redefined well by the dog owners. This will help them to a greater extent to drive away the unwanted behavior patterns in their pet dogs. For example, some dogs may often have destructive biting characters and will be seen biting chair, cloth, mats, and everything that can see. After ruling out the teething problem if it is a puppy, provide it with some large sized balls, mineral mixture based bone materials, etc. Such variety of materials help to reduce the boredom related activities.